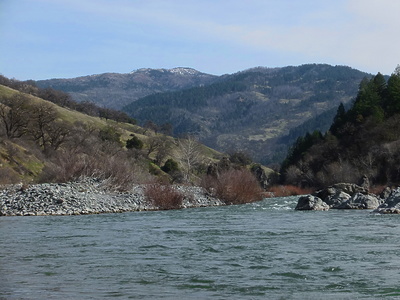 With a large drainage including snowy mountains over 7000 feet, this river often has a long season, sometimes into late May. 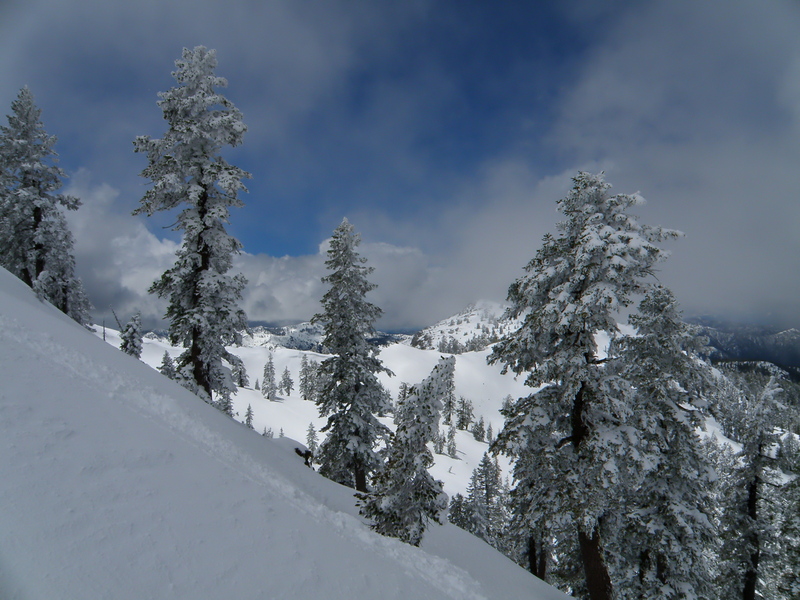 This is a good trip to select on a sunny winter weekend before the high Sierra season begins in earnest. Perhaps because of logging in the headwaters, the water is silty brown immediately after a storm, but turns whitish green after several days. The flow at take-out is available on the web, and except after storms, is only slightly higher than the flow near put-in. When flow is declining, estimate flow to the end of your trip. Float days are very long at the 800 cfs minimum. 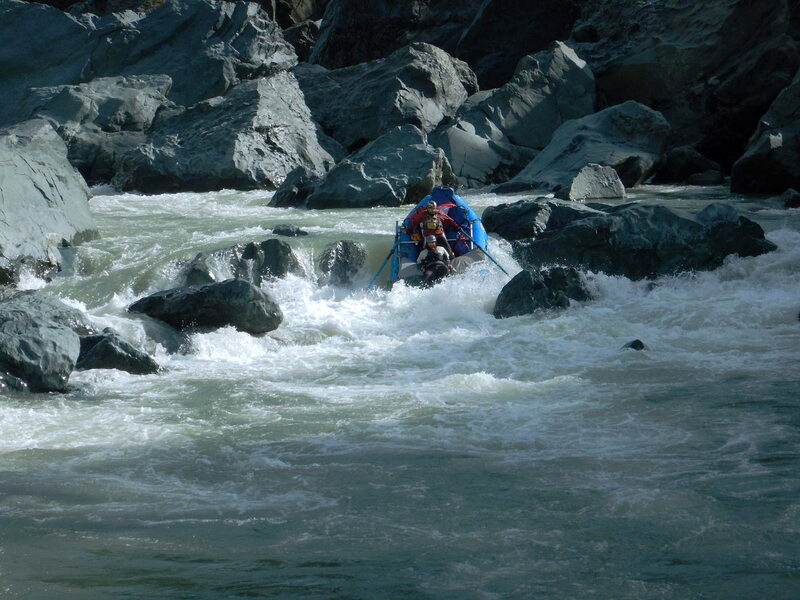 Best flows for rafting and kayaking are 1000-2000 cfs. Below 1000 Coal Mine Falls gets very rocky, and above 2000, it becomes more difficult to run or line. 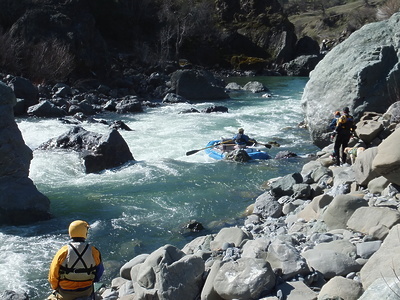 At low flows with short winter days, rafts should plan on three days. 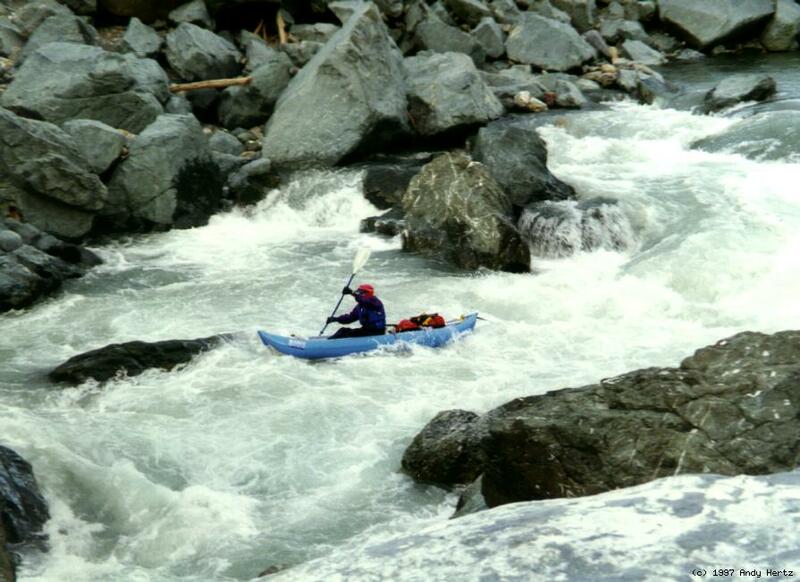 Kayakers can do this run in a single day, with an early start, at flows above 1000 cfs. 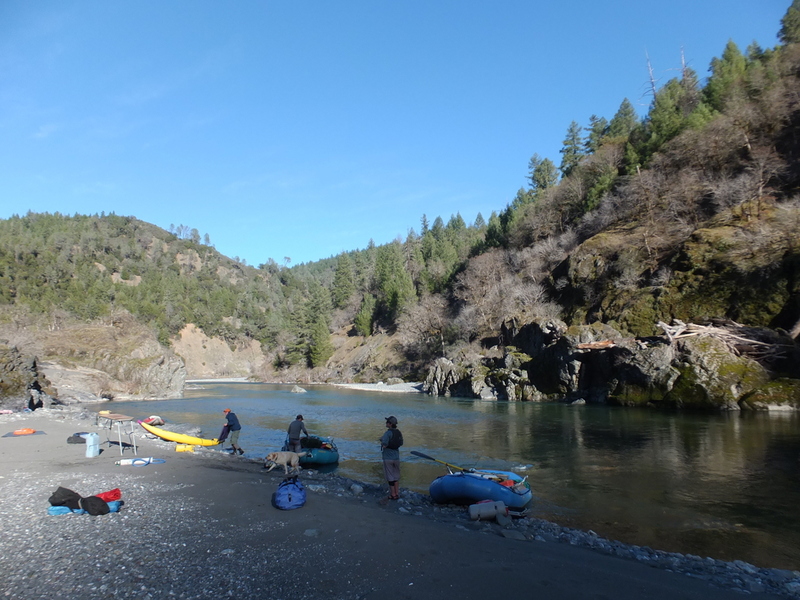 Near put-in is a USFS campground, closed in winter, across the road from an RV park operated by Black Butte River Ranch. It's probably best to get a relaxed start and spend a night along the river, where good campsites abound. A popular half-way spot is Thatcher Creek. 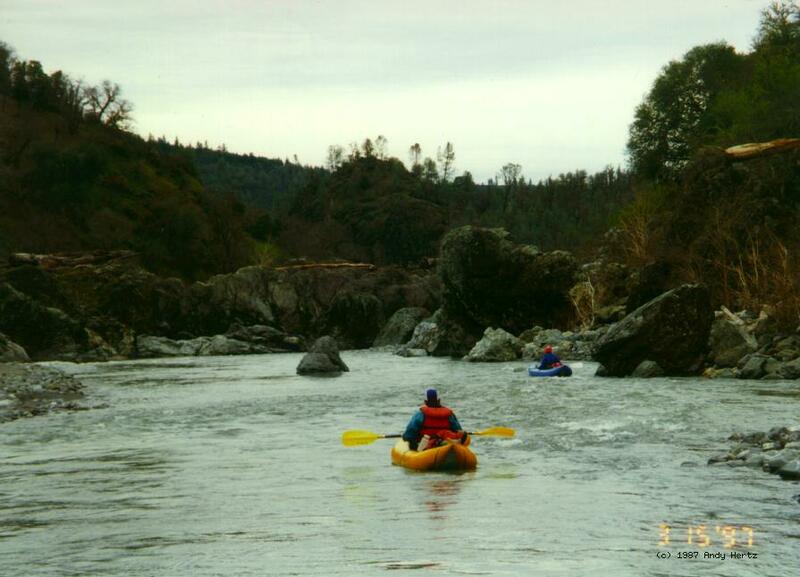 Shuttles and accommodations are available from the Black Butte River Ranch (general store, cabins, campground) near put-in, phone 707-983-9438. Mileage is marked in trip distance and river miles from the confluence (in parentheses). Put in about a quarter mile below the highway bridge over the middle fork, where a trail leads down from the parking area. This was the washed-out old road, still extant on the other side as it climbs along the Black Butte to a bridge across that river. 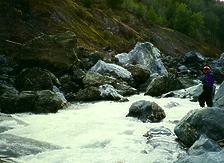 Shortly below at the confluence, flow almost doubles. Williams Creek enters on the right, and the highway leaves the river. Round Valley Indian reservation for the next half mile on the right. After another half mile, the mini-canyon ends and ranch land begins. 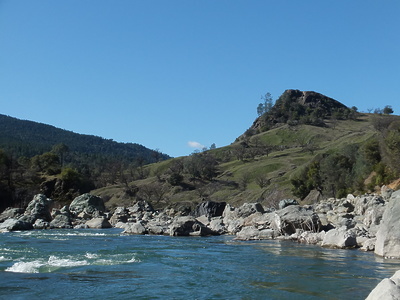 Good high-water camp on the left, where a ranch road crosses (at low flows) from river right to left, then climbs the left bank to an oak-dotted flat. 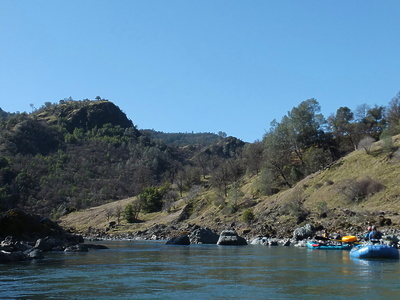 Etsel Flat ends, the river enters a forested canyon, and for the next several miles, flows thru three large but progressively tighter horseshoe bends. 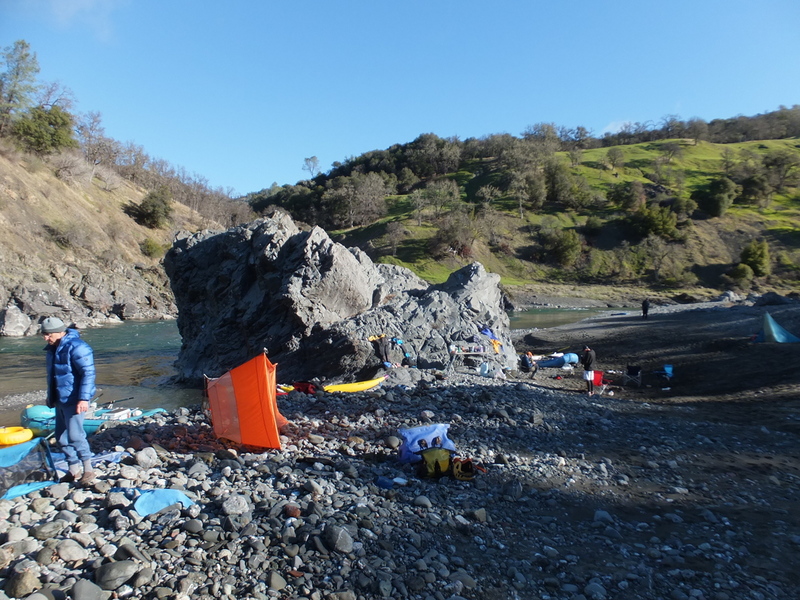 Nice low-water camp with gravel beach (almost sand) at the end of a boulder bar. George Lambert canyon on the left, and shortly below, Green Lambert canyon. 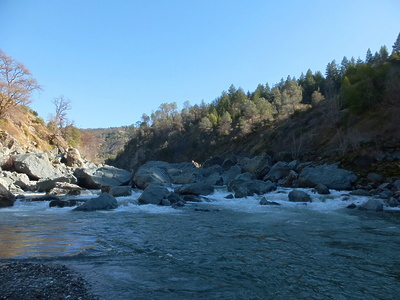 Forest turns to brush, and many structures are visible before Mill Creek enters on the right, along which a private road enters the canyon. Doe Canyon on the left. The river soon enters a beautiful rock-lined narrows. Grizzly Gulch on the right. A rough dirt road comes near the river. Hayshed Creek enters on the left. Terrain is too steep for comfortable camping. About a mile upstream, high on the north bank, are some ranch structures. Thatcher Creek enters on the left. The gravel and sand deposits along the river might be too steep to pitch a tent, but on the upriver side of the creek you can climb to a grassy flat among oak trees. 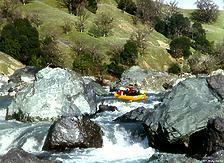 During boating season there is likely to be flowing water in pristine Thatcher Creek, due to its large drainage. Elk Creek enters on the left. A dirt road reaches the river down this canyon, with many side roads and at least one building. A dirt road reaches the river on the right bank also, where there is another building on private property. 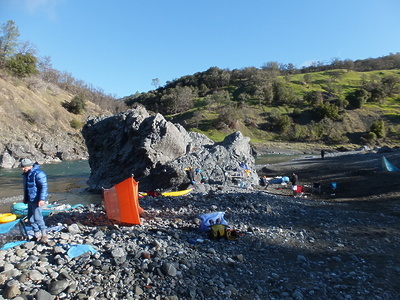 Another good campsite on river right, on the outside of a left bend, with a sandy area near large rocks, and a small lake cut off from the river. The dirt road on river right is still or again visible for another mile. 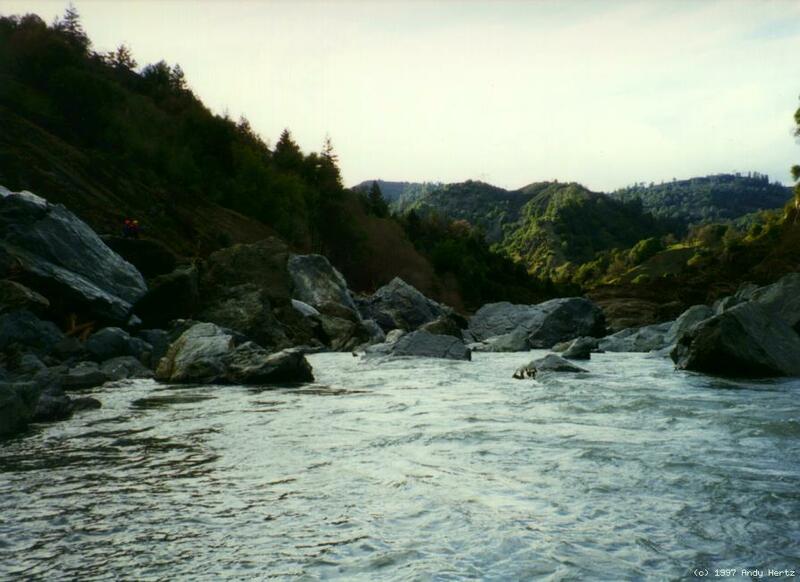 Salmon Creek on the right. Then after a left curve is a straight-away for almost a mile. It would be longer except for a jog left. Bald Mountain Canyon on the right. A house is visible not far above the river. Just below is a gigantic rock on the left. You can land boats above or below it to stay at a large flat campsite with fine gravel (almost sand) higher up. This is a good place to stay on a three-night trip. 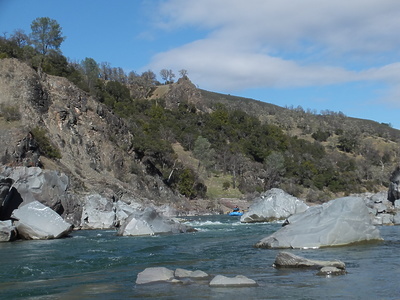 After passing some minor rapids near Round Mountain on the right, a blue-gray rock slide creates a significant rapid downstream. 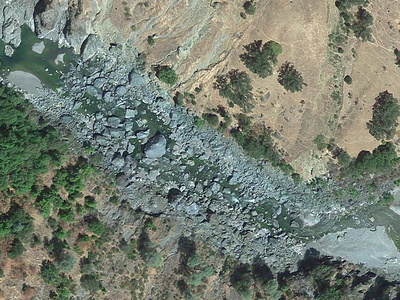 Green serpentine rock veins are visible as the river flows southwest. The river splits around a gravel island; both channels are passable (2018). 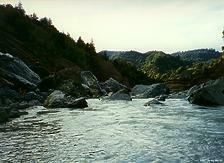 The river turns right and flows northwest. After a left turn with boulders on the right and gravel bar on the left, a dirt road reaches the river at a large triangular shaped gravel bar, which provides low-water ford access to several dirt roads on the left bank. Several houses are visible uphill, as the river arcs around this gravel bar. 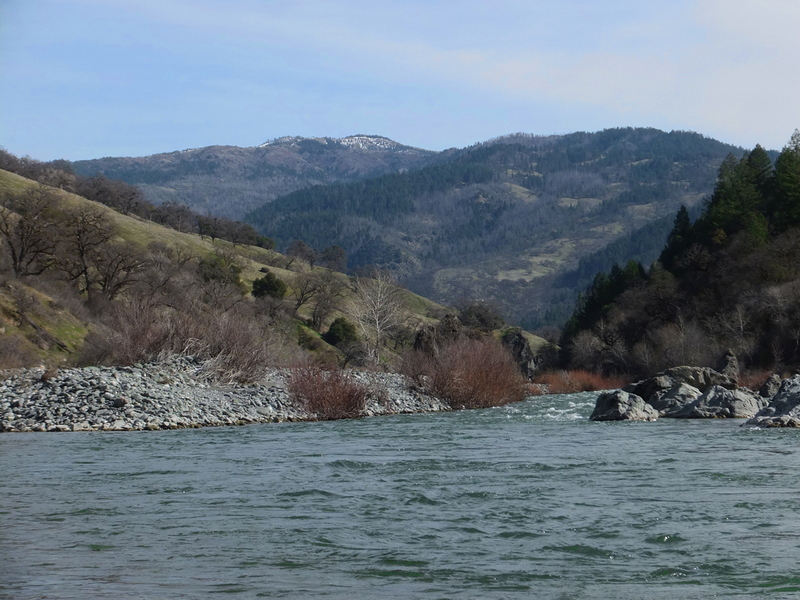 The river is fairly calm before and after passing Kelly Canyon. 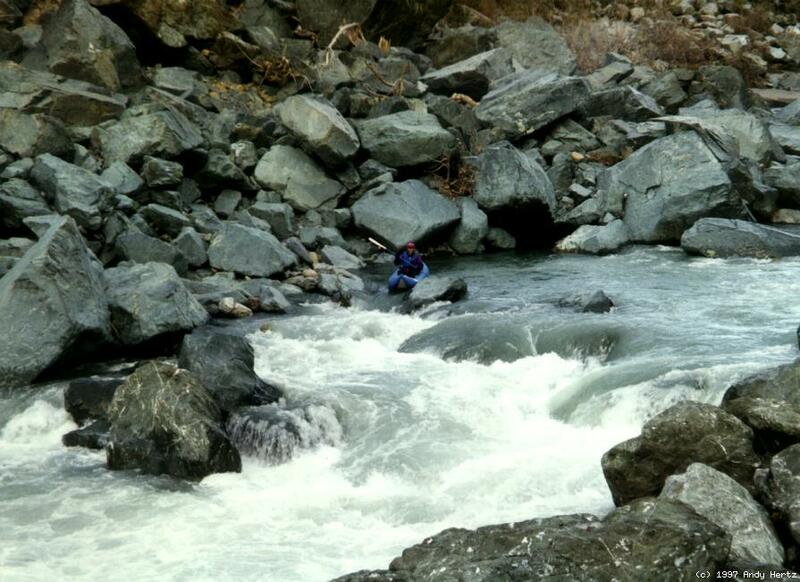 At low flows you wonder, where is Skinny Chutes? 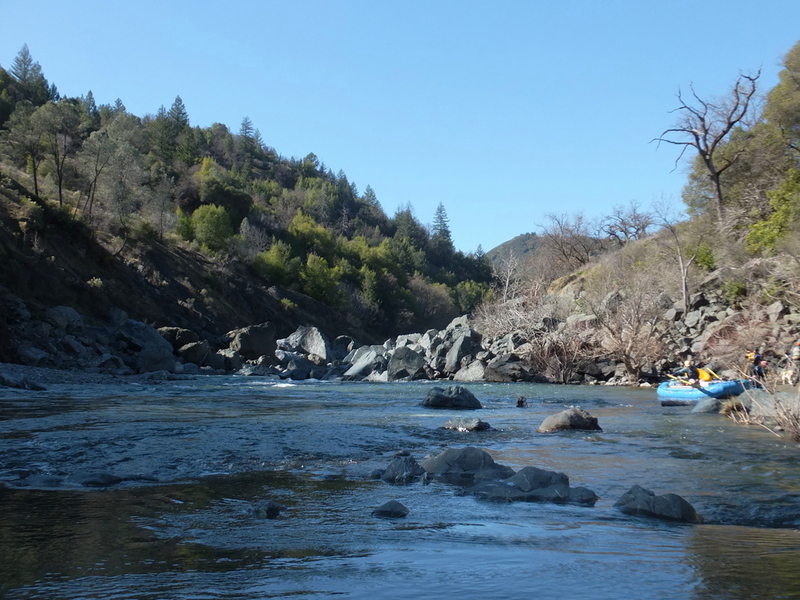 Two photos from upriver, and three photos by Andy Hertz at Skinny Chutes. Logs from flood Uncle Andy Enter left Move right Success! Recognition: heavily eroded rocks on right bank, and “mine” mountain (according to maps) ahead. The current moves left and drops steeply over a boulder bar, with a good scouting eddy below except at very high flows. 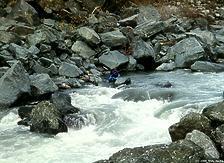 Afterwards, the current passes thru some narrow drops among big boulders. At moderate flows the best run is probably on the left side moving right. At higher flows the right side requires less tricky maneuvering. 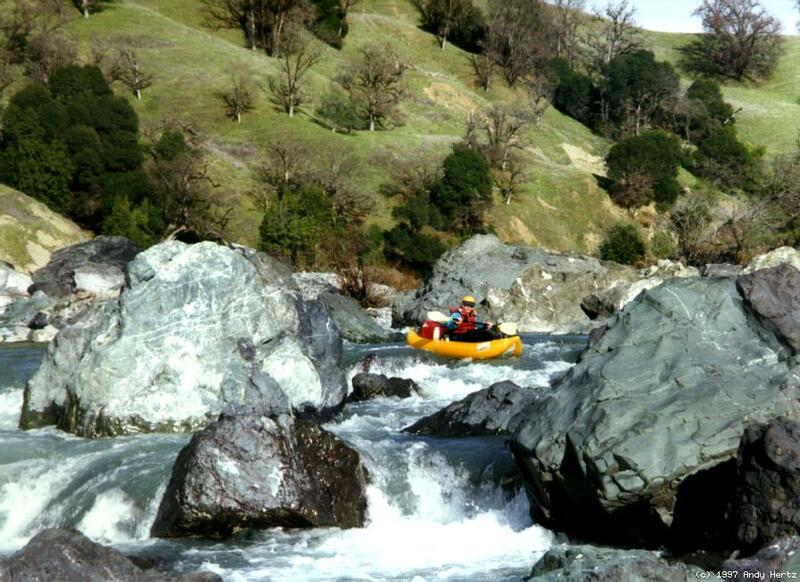 At low flows it is hard to get a raft thru here. Salt Creek enters on the left, followed by long Salt Creek rapid, a left curving gravel bar, a calm section, then drops between boulders. Some calm water remains before the falls, but dont get sucked in. The coal mine after which the falls is named was actually upriver on the mountain left of Skinny Chutes, based on satellite imagery. Coal Mine Falls, class V-, scout right. This rapid may change from year to year, especially after floods. In some years it can be easily lined on the right, or run starting from a small eddy on the right. 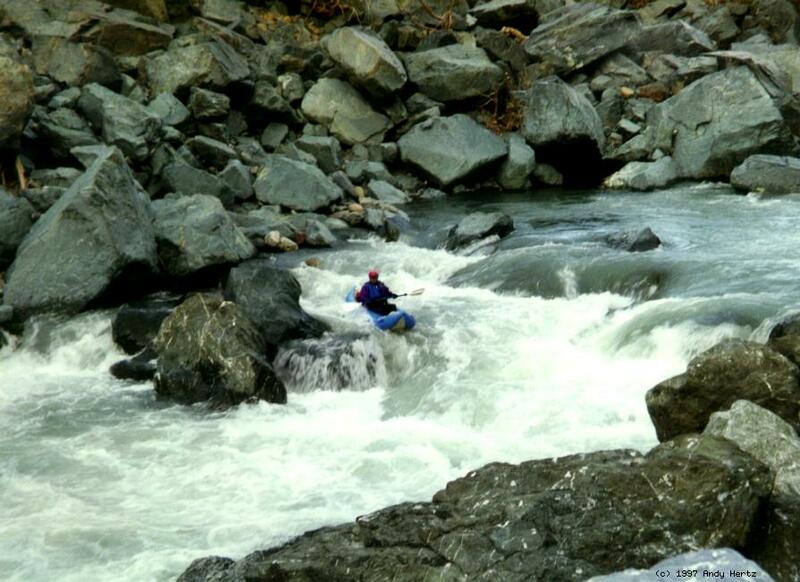 Kayakers sometimes carry the crux drop on the left and then run the remaining big drops. A kayak carry on the right is also possible, as is a passenger-assisted raft lift. The crux drop is the toughest, because of steepness, menacing holes, rocks in the wrong spot, and undercuts below. The remaining drops are easier, and at moderately low flows, there is time and space to set up safety between the sections. 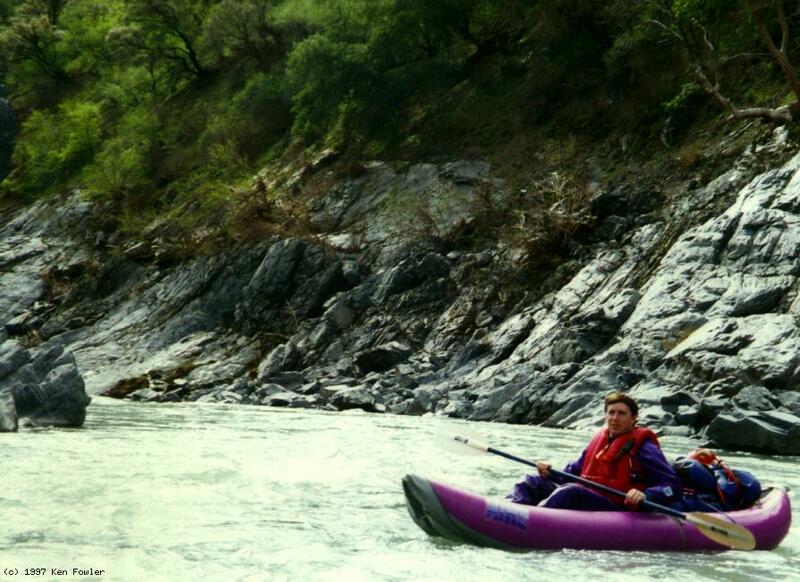 Thanks to Doug Soule for the 2009 raft photos above. 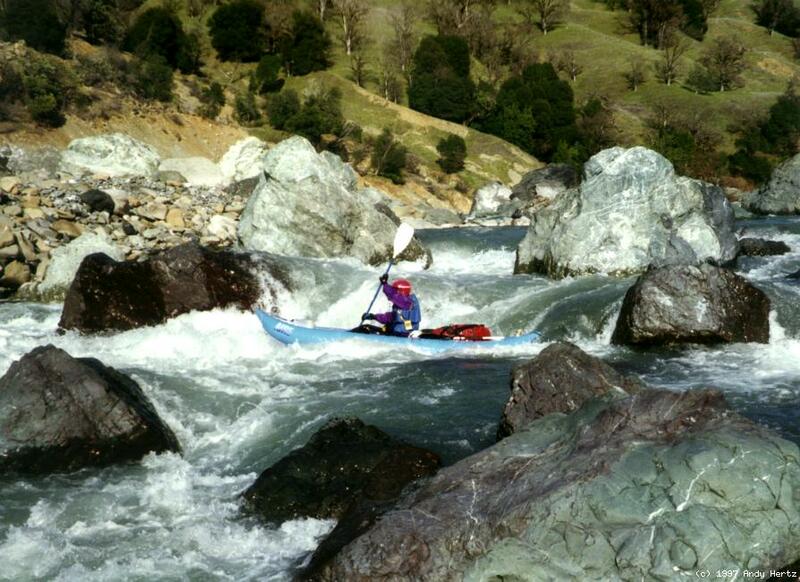 Below are Andy Hertz photos from a 1991 kayak trip. 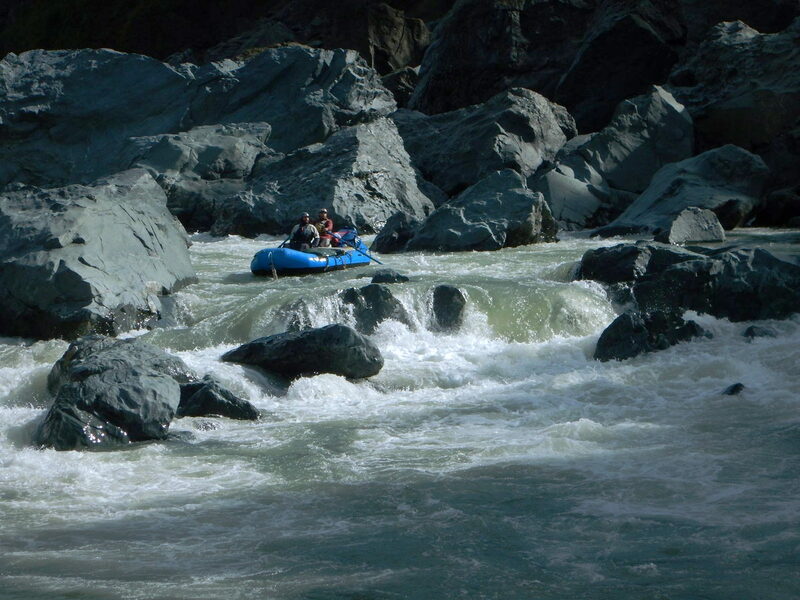 After Coal Mine Falls, which is over one-tenth mile long, the river enters a canyon containing many class II rapids. Sand Bank Creek enters on the right half a mile below. Big Water Canyon on the left, followed in .6 mile by Little Water Canyon on the left, and .4 mile later by Hosea Creek on the right. 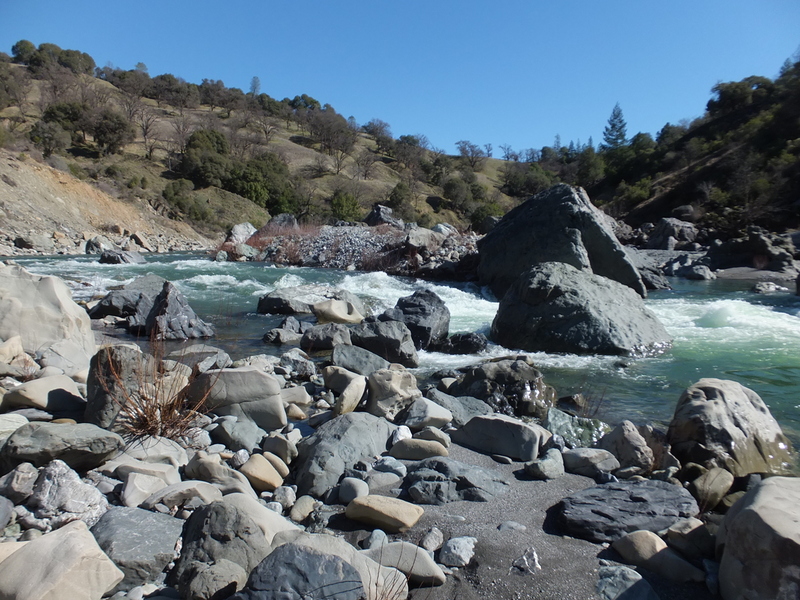 This was the planned site of controversial Dos Rios dam, which Governor Reagan cancelled, remarking, “we've already done enough to the Indians.” Covelo and most of Round Valley would have been flooded. Pickrell Creek enters on the right, near several houses. The highway is not very far up the right bank. Eastman Creek enters on the left at mile 30.7 (1.3). 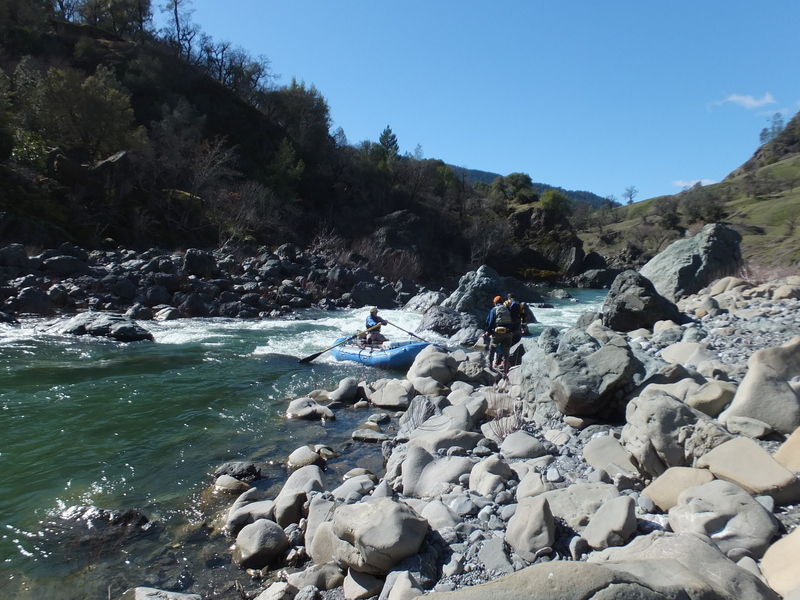 The river turns right, pours down a relatively easy boulder bar, and swings sharply around a 150' monolith, home to many birds. At the base of the monolith to the right is a rapid containing some powerful holes among a maze of large boulders. 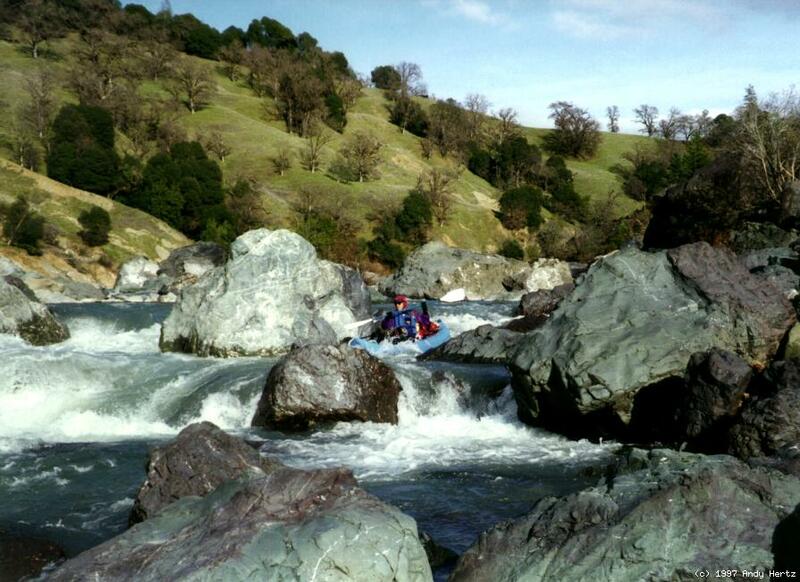 This rapid is visible and can be scouted from the shuttle road. At mile 31.3 (.7) Goforth Creek marks the end of this rapid. Covelo Road bridge overhead. About .2 mile downstream, a gravel bar offers a good take-out, but a bad climb up to the parking area near the bridge. Around the corner, Dos Rios bridge lacks parking. Confluence with the main Eel. 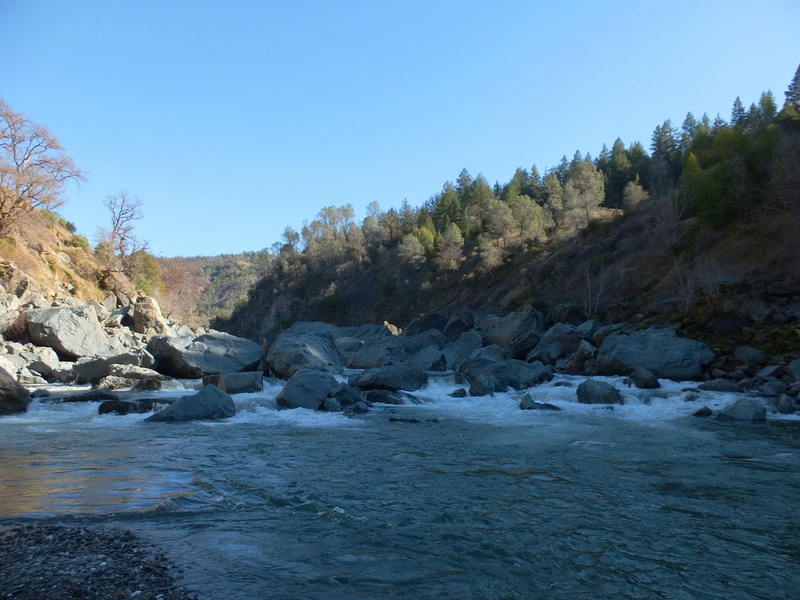 To reach take-out, go east from highway 101 on Covelo road, and drive 16 miles to a bridge where the road crosses the middle fork. 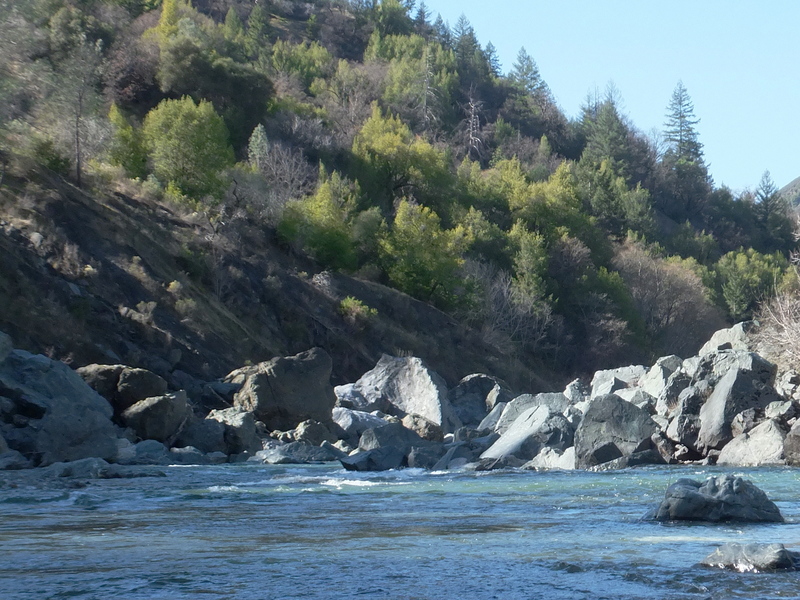 From a parking lot near the bridge, an old road leads down to a gravel bar on river left. With maintenance budgets what they are, it is unlikely you will be able to drive down to the river. To reach put-in, cross the bridge, turn right, and continue on Covelo road to the town of Covelo. One mile north of town, turn right onto Mendocino Pass road (follow highway 162 signs) and continue about 10 miles to where the road crosses the middle fork. Black Butte River Ranch is on the right just after the bridge.